Samm-Art Williams, Woodie King Jr.
With Timothy Crowe, Mary Doyle, Carol Gustafson, Neal A. Hemphill, O’Mara Leary, James O. McKissock, Dermot McNamara, Nann Mogg, Lola Pashalinski, Phillip Pruneau, David Saint, Paul Singer, David Stocker, Thomas Toner, Zachary Wyatt. Scenery, Belden, Costumes, David Toser, Lighting, Dennis Parichy, Musical direction, Barbara Damashek, Dialect coaching, Nora Dunfee, Dramaturg, Peter Sander. As PPT grew to a year-round company with a series of public outreach programs, playwriting development series and special events – in addition to the 6 mainstage productions, I sought help in providing artistic and managerial leadership. In the Sixth Season, I engaged director JRanelli as a candidate for the post. 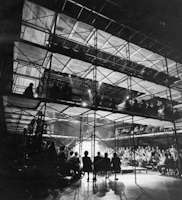 J was in residence at PPT for more than three months including the rehearsal process when he directed Galileo. For this, the Seventh Season, I engaged Larry Arrick as a candidate. I recommended that he spend almost full time at PPT, which he did including his directing 3 mainstage productions. Ultimately, Larry was appointed by the Board as Acting Artistic Director after I resigned at the end of this season. He was not my choice. My choice was to have Terry Schreiber and Jack Going share the artistic direction of PPT. They had worked here several times with enormous success. They knew most of the Board of Directors. They had worked with the administrative and technical staffs of the organization. They had the depth of contacts within the regional and New York theater communities. They wanted the positions. The Board chose Arrick. With David Eric, Pamela Kalt, Rosemary McNamara, Zelda Puliam and Allan Stevens. Scenery by Jonathan Arkin, Costumes, David Toser, Lighting, Ron Wallace, Musical direction, John Franceschina, Musicians were Jeffrey Klotz, Jan Fung, James E. Guerra, Randy Purcell, Dramaturg, Barry Paris. With Carl Crudup, Nadyne Cassandra Spratt and Elizabeth Van Dyke. Designers were Ursula Belden, scenery; Rebecca Senske, costumes, Ron Wallace, lighting. Samm-Art made an emergency visit to PPT as an actor when the man playing the leading character, Cephus, had to be replaced. Thanks to the personal relationship that Woodie had with Samm-Art – and the good fortune that the playwright was available to become an actor for several performances—we made a bit of theater history. He gave a very strong and very well received performance. No surprise. With John Carpenter, Michael Cook, Jeffrey L. deJesus, Elisabeth Orion, Phillip Pruneau, David Purdham, Hugh A. Rose, Diana M. Scott, April Shawhan, John Shuman, Margo Skinner, Donna Snow and Daniel Von Bargen. Designers: John Jensen returned to PPT to design the scenery. William Schroder designed costumes. Dennis Parichy returned to design lighting. With Pamela Burrell, David bush, Oliver Cliff, Alan Cook, Robert Curtis-Brown, Keith David, Ron Faber, Frances Gable, Leland Foster Gantt, Stephen Gruwell, Thomas Harmon, Eric Hoffman, Clyde Jones, Jodi Long, Michael McKee, Ken Milchick, Randy Miles, Jeffrey Paul, Phillip Pruneau, Hugh A. Rose, J. Smith-Cameron and Daniel Von Bargen. Designed by: John Jensen, William Schroder, and Dennis Parichy. Music director was Jeffrey Klotz and David Ball was the dramaturg. I chose not to direct any play this season because from the end of the Sixth Season and for the next several months into the planning and implementing of the Seventh, I was committed to doing everything I possibly could to bring to action PPTs commitment to actually begin raising funds for its new theater facility. I met continually with corporate executives, foundation directors in Pittsburgh and nationally and with each member of our Board of Directors. Would any or all of them step up to meet the promise PPT had made? While those outside PPT – foundations and corporations—looked favorably on the opportunity we appeared to be ready for -- to build a new facility -- they made it clear that at least 50% of the initial funds to commence building would have to be raised by the Board of Directors before they would grant meaningful financial support. The most difficult meetings were those I had with Mayor Caligiuri and other government principals who had done so much to provide us the platform to get where we were at the end of November 1981. Their to challenged us to move our ever-growing success story where they wanted to see it -- as part of their restoration vision of a downtown Pittsburgh cultural center. A challenge PPT publicly accepted more than two years ago. Was the public commitment to grow our artistic salaries as well as our proven popularity in fact becoming nullified? Throughout the internal conferences both one on one and at Board meetings I emphasized the requirement that the fundraising commitment had to be announced by the end of December 1981. Or we would be another 12 months late for the significant fundraising calendar for 1983. We had already missed application dates for the 1982 fundraising agendas because of failure to commit. If the Board were going to maintain its position of No-Commitment-Not Yet-Certainly Not Now, the credibility of PPTs mission to expand would continue to decline. If the Board would not commit I notified them I would resign effective after the opening of this season’s final production. During the next few months, probably through the end of March 1982, I was counseled to be patient. I replied that I had come to believe this particular Board of Directors would not be willing or able to take the required actions. Not in the foreseeable future. And I was clear about my unwillingness to continue to subsidize the success of PPT via low salaries to its creative personnel. There was no movement by them or by me. And on July 4, 1982, after the successful opening of Stephen Kanee’s lyrical-high and low comedic production of A Midsummer Night’s Dream, I left the Pittsburgh Public Theater. Being Disappointed: There was great sadness and strong disappointment in many hearts and minds. No one who saw PPTs birth and growth from an idea into a nationally recognized artistic institution with a year-round repertory was untouched by the turn of events. While I confided continually with my co-founders Joan Apt and Margaret Rieck about the deadline I believed was essential for the promise to be kept, I also discussed with them my own increasing disappointment at the lack of progress, any progress. I told them that I would probably resign at the end of the Seventh Season. Before anyone else knew that I had indeed arrived at that decision, I informed Joan and Margaret. Did they feel betrayed, abandoned, furious? Probably. Others were in equal measure sad and supportive. I was just disappointed through and through. I know I produced as exceptionally strong final season of artistic direction, business and box office success and public relations management that as much as possible kept private the major change that was about to take place. Being Disappeared: Within a few months of my departing and certainly within PPTs eighth season, beginning two months after my departure, no trace of Ben Shaktman’s name could be found there. I was removed as a Trustee/Director. Not informed or discussed. Made gone. My identity as a founder and the founding general/artistic director was expunged. It has remained that way. Since then, when others have called my attention to publications, documents, “histories” and special anniversaries or events informing me of my being disappeared, I have expressed myself so those then/now in charge would be required to correct the revisionism of history. As a parent remains that to his offspring forever, as an architect’s building is recognized, identified as his or hers as much as anyone’s, it is a cherished tradition in every institutional theater worldwide that the founding artistic director—and there usually can be only one -- remains honored throughout the life of the theater he or she created. Not at the Pittsburgh Public Theater. Not yet.